The equity market closed positive as investors capitalize on cheap and fundamentally sound stocks especially in the banking sector. Hence, the All Share Index (ASI) ramped up 2.9% W-o-W to 31,529.9 points while YTD performance improved to 0.3%. Sector performance was largely bullish as all sectors gained W-o-W save for the Industrial sector which was down by 0.7%. The banking index led gainers, up 8.1%, trailed by the Consumer Goods (+4.1%), Insurance (+4.0%) and Oil & Gas (+2.5%) indices. The top performing stocks for the week were REGALINS (+19.0%), DANGFLOUR (+18.1%) and GUARANTY (+14.7%) while ROYALEX (-13.3%) GUINEAINS (-13.0%) and CHAMPION (-10.0%) led laggards. The Afrinvest Weekly Sentiment Indicator strengthened to 3.5 points from 2.7 points recorded in the prior week buoyed by improved economic sentiment. Following the bullish performance last week, we expect market participants to book profits on portfolios during the week based on associated uncertainty leading up to the presidential elections this Saturday. 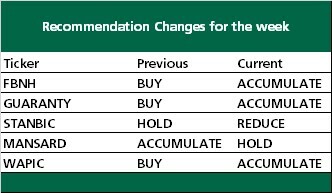 The performance of stocks on our equity watch-list from track period till date are as follows; GUARANTY (+12.0%), ZENITH (+5.9%), DANGCEM (-0.3%), OKOMU (+11.5%), and NIGERIAN BREWERIES (-0.4%).